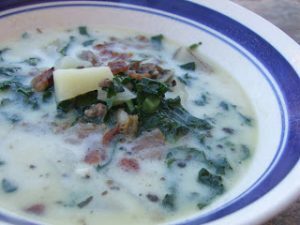 I fell in love with Olive Garden’s Zuppa Tuscan Soup this summer while visiting family on the east coast. I knew that I need to recreate at home. Even though it doesn’t taste exactly the same it comes pretty close and really hits the spot on a cool day. It is also a great way to stretch your meat and get more nourishing chicken stock in your diet! Cook your italian sausage in a soup pot over medium heat until completely cooked and crumbly. Remove and set aside. Fry the bacon in the soup pot until almost crispy. Remove from the pot and set aside leaving the grease in the pot. Add the onions and garlic to the soup pot and cook until soft stirring occasionally. While the onions and garlic and cooking, chop the bacon into tiny pieces. Pour in the chicken stock an add the potatoes. Once boiling reduce to a simmer and cook until the potatoes are just almost soft. Add the kale and cook for 10 minutes, or until soft. Pour in the milk stirring slowly. Add the Italian sausage, salt and pepper. Return to a simmer and then turn off the heat. Serve into individual bowls, garnish with the bacon crumbles and grated parmaesan cheese. Thanks so much for sharing this recipe with Sunday Night Soup Night. I’ll be hosting weekly through fall and winter, so I’d love to see you again with your next soup/stock/chowder recipe! This soup looks delicious, Thanks for sharing with Hearth and Soul Hop. This looks delicious! Thanks for sharing with the Hearth and Soul hop. This sounds so tasty! I’m hosting a weekly blog carnival specifically for soups, stocks and chowders, every Sunday. I would love it if you would come over and post this recipe. Here’s a link with more info.